Primary objective of day-to-day ongoing researches is to optimize healing and the biggest challenges that the researchers are facing is the development of a regenerative biomaterial to regulate inflammation and accelerate wound healing. Healing is a complex process that involves organization of cells, biochemical triggers, and extracellular matrix synthesis for repair of the tissue. Role of platelets in hemostasis and wound healing is well established, but the exact mechanism of healing in depth is still unclear. Role of platelets in regeneration was proven way back in the 1970s, owing to the fact that it is a reservoir of growth factors that are responsible for neovascularization, collagen synthesis, cell division, cell differentiation, induction, and migration of other cells to the injured site. Postperiodontal surgery, wound healing occurs through a complex interaction between gingival fibroblasts, periodontal ligament cells, osteoblasts, and epithelial cell. Damage of blood vessels results in fibrin formation followed by platelet aggregation and elaboration of growth factors in the tissues. This cellular interaction is under molecular control of biochemical mediators, i.e., cytokines and growth factors. The crucial role of platelets in inflammation and wound healing is due to the presence of several growth factors and cytokines. Furthermore, they contain fibrin, fibronectin, and vitronectin that provide connective tissue, a matrix and create an efficient network for cell migration. This has led to the idea of using platelets as therapeutic tools to improve tissue repair, particularly in wound healing. The PubMed database of the US National Library of Medicine was utilized as the electronic databases, and a literature search was accomplished on articles using combination of various MeSH and free text words “Platelet rich fibrin or PRF and Periodontal therapy,” “Platelet rich fibrin or PRF and clinical applications,” “Platelet rich fibrin or PRF and Periodontology” from January 2006 to August 2016. A total of 49 scientific papers (14 in vitro, 2 animal, and 33 clinical studies) meeting the criteria were scrutinized. There was no restriction on the language and publication status imposed on the articles. Further additional studies were sought by searching the reference lists of identified trials and reviews. Following the debates about the various components of these platelet-rich concentrate preparations, a first classification was proposed by Dohan Ehrenfest et al., 2009, which is now widely accepted. The classification is simple and is based on the presence or absence of leukocytes and the density of fibrin architecture in platelet concentrates. 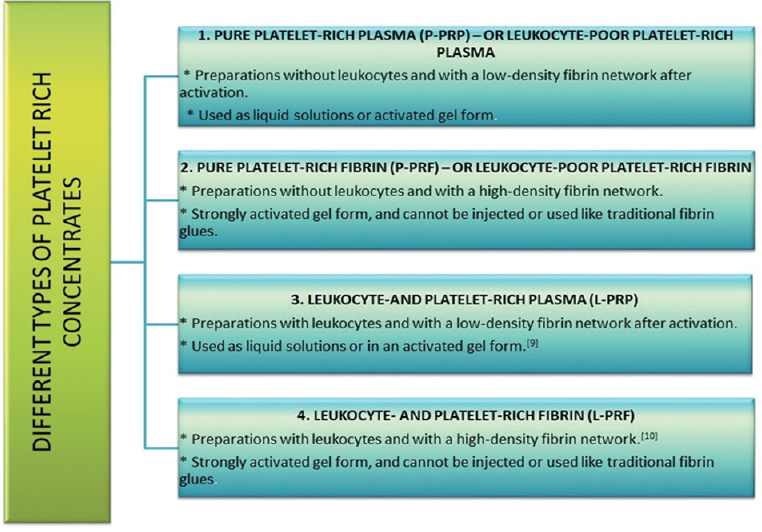 Depending on the difference in these parameters, it can be divided into the following four main types, i.e., pure platelet-rich plasma, pure platelet-rich fibrin (PRF), leukocyte and platelet-rich plasma, and leukocyte and PRF which are described here forth in [Figure 1]. A convincing healing bioregenerative material, PRF, shows compelling data in various in vitro and clinical studies. It can be utilized in various procedures such as management of intrabony defects, gingival recession, furcation defects, extraction socket preservation, and accelerated healing of wound. The following are some of the important studies highlighting its regenerative potential in the field of Periodontology [Table 1]. The regeneration of the lost periodontal structures is the ultimate aim of the periodontal therapy to restore the health, function, and esthetics of periodontium. From periodontal point of view, the experimental and in vitro studies emphasizing the role of PRF on periodontal regeneration and periodontal wound healing are important and hereby discussed. The breakthrough in vitro study that introduced PRF in medical field was conducted by Choukroun et al. It highlighted improved neovascularization, wound closing with accelerated tissue remodeling in the absence of infectious events. PRF used either in combination with bone grafts (bovine porous bone mineral, nanocrystalline hydroxyapatite, and demineralized freeze-dried bone allograft [DFDBA]) or pharmacologic agents such as metformin gel was found to be more effective in terms of improvements in clinical parameters and radiographic defect depth reduction compared to when bone grafts or metformin used alone.,,,, Furthermore, the clinical and radiographic results of PRF used alone were comparable to DFDBA for periodontal regeneration. Although the efficacy of PRF as compared to Emdogain was found to be inferior in terms of defect resolution. Studies have shown similar probing depth reduction, clinical attachment level gain, bone fill at sites treated with PRF, or PRF with open flap debridement. However, due to the fact that PRF is less technique sensitive, it may be considered as a better treatment option than PRF. A systematic meta-analysis by Moraschini and Barboza Edos  and clinical studies by Keceli et al. and Gupta et al. have highlighted the inconsistent results of PRF in covering Miller Class I and Class II gingival recessions with no improvement in terms of root coverage, keratinized mucosa width, or clinical attachment level, but it was shown to have increased the gingival thickness. Further, Padma et al. in a randomized controlled trial proved predictable treatment for isolated Miller class I and II recession defects when used with coronally advanced flap. It provided superior root coverage with added benefit in gain in clinical attachment level and width of keratinized gingiva after 6 months postoperatively. On comparing with PRF and connective tissue graft (CTG) in gingival recession procedures, it was found that there was a greater gain in keratinized tissue width in CTG group but better wound healing in PRF group. Similar to the management of infrabony defects, the use of PRF in furcation defects when combined with bone grafts (hydroxyapatite) and rosuvastatin has shown better results emphasizing its role in periodontal regeneration. Various in vitro studies have shown a positive biological effect in human gingival fibroblast which can have a potential role in the management of gingival recession and periodontal tissue engineering. It is well established that PRF contains soluble growth factors that not only stimulate tissue healing but also bone regeneration. For guided tissue regeneration procedures, PRF has proved to be superior scaffold as compared to collagen membrane when used for in vitro cultivation of periosteal cells. PRF has also shown remarkable positive healing effects when used for the preservation of extraction socket and in sinus lift procedures during simultaneous dental implantation (Jeong et al., 2014). The studies show outstanding results with PRF in regenerating periodontal osseous defects and preserving extraction healing socket. Although there were conflicting data when PRF was used for managing gingival recession defects for root coverage. 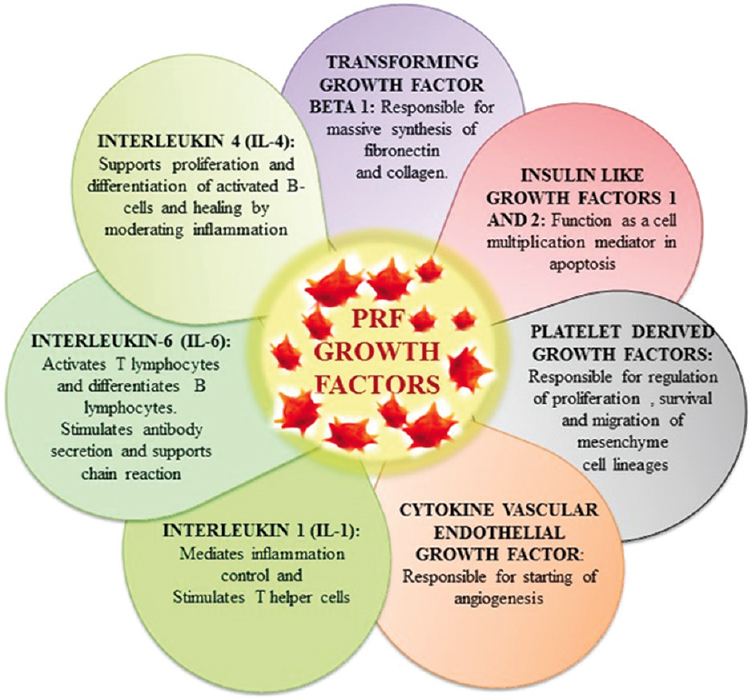 Studies have confirmed that PRF is a therapeutic regenerative biomaterial with immense potentiality that has widespread clinical applications in medical as well as dental perspectives. The use of PRF alone or in combination with other biomaterials (such as bone grafts, soft tissue grafts, and pharmacologic agents) provided safe and promising results in the form of improvements in clinical and radiographic parameters in the management of periodontal osseous defects and hard tissue preservation of extraction socket. Although in denuded root coverage procedures in cases of gingival recessions, PRF showed some contradictory findings, and the results were not that favorable, but still, it provided an added advantage in terms of increment in gingival tissue width and thickness (gingival biotype). Tissue biotype is an important factor because it narrates the way a tissue will respond to inflammation, trauma, and surgical insult. Hence PRF does result in thick gingival biotype which shows greater dimensional stability during remodeling and enhancing collateral blood supply to the underlying osseous structure as compared to thin biotype which may compromise it. Although the potentiality of this nonexpensive, autologous biomaterial is encouraging, preparation and storage after preparation form the loop holes that need attention. The time interval between the speed of handling and ultimately its usage is highly crucial for its structural integrity and leukocyte viability. Hence, these limitations should be focused and worked upon by the researchers. Further validation is needed in the form of long-term randomized control studies with larger sample sizes to affirm the benefits and identifying the hidden potential of PRF as a biomaterial in the field of clinical periodontology. Gassling VL, Açil Y, Springer IN, Hubert N, Wiltfang J. Platelet-rich plasma and platelet-rich fibrin in human cell culture. Oral Surg Oral Med Oral Pathol Oral Radiol Endod 2009;108:48-55. Ross R, Glomset J, Kariya B, Harker L. A platelet-dependent serum factor that stimulates the proliferation of arterial smooth muscle cells in vitro. Proc Natl Acad Sci U S A 1974;71:1207-10. Kiran NK, Mukunda KS, Tilak Raj TN. Platelet concentrates: A promising innovation in dentistry. J Dent Sci Res 2011;2:50-61. Deodhar AK, Rana RE. Surgical physiology of wound healing: A review. J Postgrad Med 1997;43:52-6. Giannobile WV. Periodontal tissue engineering by growth factors. Bone 1996;19:23-37. Everts PA, Hoffmann J, Weibrich G, Mahoney CB, Schönberger JP, van Zundert A, et al. Differences in platelet growth factor release and leucocyte kinetics during autologous platelet gel formation. Transfus Med 2006;16:363-8. Cromack DT, Porras-Reyes B, Mustoe TA. Current concepts in wound healing: Growth factor and macrophage interaction. J Trauma 1990;30:S129-33. Toffler M, Toscano N, Holtzclaw D, Corso MD, Dohan Ehrenfest DM. Introducing Choukroun's platelet rich fibrin (PRF) to the reconstructive surgery milieu. J Implant Adv Clin Dent 2009;1:21-30. Agarwal A, Gupta ND, Jain A. Platelet rich fibrin combined with decalcified freeze-dried bone allograft for the treatment of human intrabony periodontal defects: A randomized split mouth clinical trail. Acta Odontol Scand 2016;74:36-43. Pradeep AR, Nagpal K, Karvekar S, Patnaik K, Naik SB, Guruprasad CN, et al. Platelet-rich fibrin with 1% metformin for the treatment of intrabony defects in chronic periodontitis: A randomized controlled clinical trial. J Periodontol 2015;86:729-37. Shah M, Patel J, Dave D, Shah S. Comparative evaluation of platelet-rich fibrin with demineralized freeze-dried bone allograft in periodontal infrabony defects: A randomized controlled clinical study. J Indian Soc Periodontol 2015;19:56-60. Gupta SJ, Jhingran R, Gupta V, Bains VK, Madan R, Rizvi I, et al. Efficacy of platelet-rich fibrin vs. enamel matrix derivative in the treatment of periodontal intrabony defects: A clinical and cone beam computed tomography study. J Int Acad Periodontol 2014;16:86-96. Pradeep AR, Rao NS, Agarwal E, Bajaj P, Kumari M, Naik SB, et al. Comparative evaluation of autologous platelet-rich fibrin and platelet-rich plasma in the treatment of 3-wall intrabony defects in chronic periodontitis: A randomized controlled clinical trial. J Periodontol 2012;83:1499-507. Sharma A, Pradeep AR. Treatment of 3-wall intrabony defects in patients with chronic periodontitis with autologous platelet-rich fibrin: A randomized controlled clinical trial. J Periodontol 2011;82:1705-12. Eren G, Tervahartiala T, Sorsa T, Atilla G. Cytokine (interleukin-1beta) and MMP levels in gingival crevicular fluid after use of platelet-rich fibrin or connective tissue graft in the treatment of localized gingival recessions. J Periodontal Res 2016;51:481-8. Femminella B, Iaconi MC, Di Tullio M, Romano L, Sinjari B, D'Arcangelo C, et al. Clinical comparison of platelet-rich fibrin and a gelatin sponge in the management of palatal wounds after epithelialized free gingival graft harvest: A randomized clinical trial. J Periodontol 2016;87:103-13. Moraschini V, Barboza Edos S. Use of platelet-rich fibrin membrane in the treatment of gingival recession: A systematic review and meta-analysis. J Periodontol 2016;87:281-90. Keceli HG, Kamak G, Erdemir EO, Evginer MS, Dolgun A. The adjunctive effect of platelet-rich fibrin to connective tissue graft in the treatment of buccal recession defects: Results of a randomized, parallel-group controlled trial. J Periodontol 2015;86:1221-30. Doğan ŞB, Dede FÖ, Ballı U, Atalay EN, Durmuşlar MC. Concentrated growth factor in the treatment of adjacent multiple gingival recessions: A split-mouth randomized clinical trial. J Clin Periodontol 2015;42:868-75. Aras I, Olmez S, Akay MC, Oztürk VO, Aras A. Treatment of lateral open bite with vertical dentoalveolar distraction osteogenesis. Am J Orthod Dentofacial Orthop 2015;148:321-31. Gupta S, Banthia R, Singh P, Banthia P, Raje S, Aggarwal N, et al. Clinical evaluation and comparison of the efficacy of coronally advanced flap alone and in combination with platelet rich fibrin membrane in the treatment of Miller Class I and II gingival recessions. Contemp Clin Dent 2015;6:153-60. Thamaraiselvan M, Elavarasu S, Thangakumaran S, Gadagi JS, Arthie T. Comparative clinical evaluation of coronally advanced flap with or without platelet rich fibrin membrane in the treatment of isolated gingival recession. J Indian Soc Periodontol 2015;19:66-71. TunalΙ M, Özdemir H, ArabacΙ T, Gürbüzer B, Pikdöken L, Firatli E, et al. Clinical evaluation of autologous platelet-rich fibrin in the treatment of multiple adjacent gingival recession defects: A 12-month study. Int J Periodontics Restorative Dent 2015;35:105-14. Shetty SS, Chatterjee A, Bose S. Bilateral multiple recession coverage with platelet-rich fibrin in comparison with amniotic membrane. J Indian Soc Periodontol 2014;18:102-6. Agarwal K, Chandra C, Agarwal K, Kumar N. Lateral sliding bridge flap technique along with platelet rich fibrin and guided tissue regeneration for root coverage. J Indian Soc Periodontol 2013;17:801-5. Padma R, Shilpa A, Kumar PA, Nagasri M, Kumar C, Sreedhar A, et al. A split mouth randomized controlled study to evaluate the adjunctive effect of platelet-rich fibrin to coronally advanced flap in miller's Class-I and II recession defects. J Indian Soc Periodontol 2013;17:631-6. Jankovic S, Aleksic Z, Milinkovic I, Dimitrijevic B. The coronally advanced flap in combination with platelet-rich fibrin (PRF) and enamel matrix derivative in the treatment of gingival recession: A comparative study. Eur J Esthet Dent 2010;5:260-73. Aleksić Z, Janković S, Dimitrijević B, Divnić-Resnik T, Milinković I, Leković V, et al. The use of platelet-rich fibrin membrane in gingival recession treatment. Srp Arh Celok Lek 2010;138:11-8. Pradeep AR, Karvekar S, Nagpal K, Patnaik K, Raju A, Singh P, et al. Rosuvastatin 1.2 mg in situ gel combined with 1:1 mixture of autologous platelet-rich fibrin and porous hydroxyapatite bone graft in surgical treatment of mandibular class II furcation defects: A randomized clinical control trial. J Periodontol 2016;87:5-13. Bajaj P, Pradeep AR, Agarwal E, Rao NS, Naik SB, Priyanka N, et al. Comparative evaluation of autologous platelet-rich fibrin and platelet-rich plasma in the treatment of mandibular degree II furcation defects: A randomized controlled clinical trial. J Periodontal Res 2013;48:573-81. Sharma A, Pradeep AR. Autologous platelet-rich fibrin in the treatment of mandibular degree II furcation defects: A randomized clinical trial. J Periodontol 2011;82:1396-403. Fan WJ, Yang M, Zhang C, Xue R, Zhang W, Qin HX, et al. Effects of choukroun's platelet-rich fibrin on human gingival fibroblasts proliferation, migration and type I collagen secretion. Zhonghua Kou Qiang Yi Xue Za Zhi 2013;48:72-6. Clipet F, Tricot S, Alno N, Massot M, Solhi H, Cathelineau G, et al. In vitro effects of choukroun's platelet-rich fibrin conditioned medium on 3 different cell lines implicated in dental implantology. Implant Dent 2012;21:51-6. Gassling V, Douglas T, Warnke PH, Açil Y, Wiltfang J, Becker ST, et al. Platelet-rich fibrin membranes as scaffolds for periosteal tissue engineering. Clin Oral Implants Res 2010;21:543-9. Del Fabbro M, Corbella S, Taschieri S, Francetti L, Weinstein R. Autologous platelet concentrate for post-extraction socket healing: A systematic review. Eur J Oral Implantol 2014;7:333-44. Jeong SM, Lee CU, Son JS, Oh JH, Fang Y, Choi BH, et al. Simultaneous sinus lift and implantation using platelet-rich fibrin as sole grafting material. J Craniomaxillofac Surg 2014;42:990-4. Hatakeyama I, Marukawa E, Takahashi Y, Omura K. Effects of platelet-poor plasma, platelet-rich plasma, and platelet-rich fibrin on healing of extraction sockets with buccal dehiscence in dogs. Tissue Eng Part A 2014;20:874-82. Hauser F, Gaydarov N, Badoud I, Vazquez L, Bernard JP, Ammann P, et al. Clinical and histological evaluation of postextraction platelet-rich fibrin socket filling: A prospective randomized controlled study. Implant Dent 2013;22:295-303.